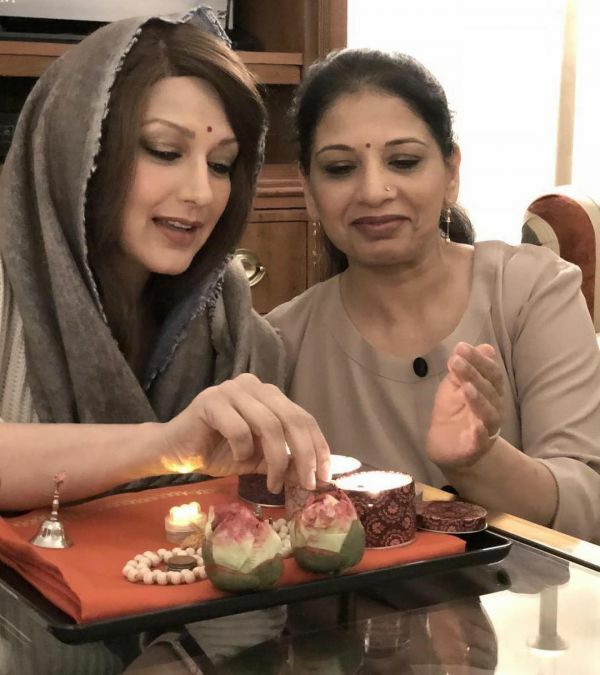 It has been more than six months since Bollywood actress Sonali Bendre was diagnosed with cancer. She has been undergoing her treatment in New York, but earlier this week, she returned to India 'where her heart is'. In her last Instagram post, Sonali mentioned that she was "looking forward to this happy interval" while adding that the "fight is not yet over." And there is one person she has to thank for, for being with her through this journey. 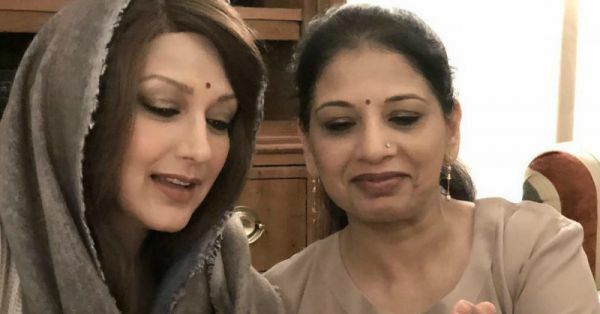 Recently, Sonali posted the sweetest pictures with her 'rock', her elder sister, Rupa Ranadive and we are trying to hold it together having read her emotional caption. Sonali quoted Pam Brown saying, "An older sister is a friend and defender - a listener, a conspirator, a counselor and a sharer of delights. And sorrows too." She added, "Rupa Tai has been all this and more". And we couldn't agree more. 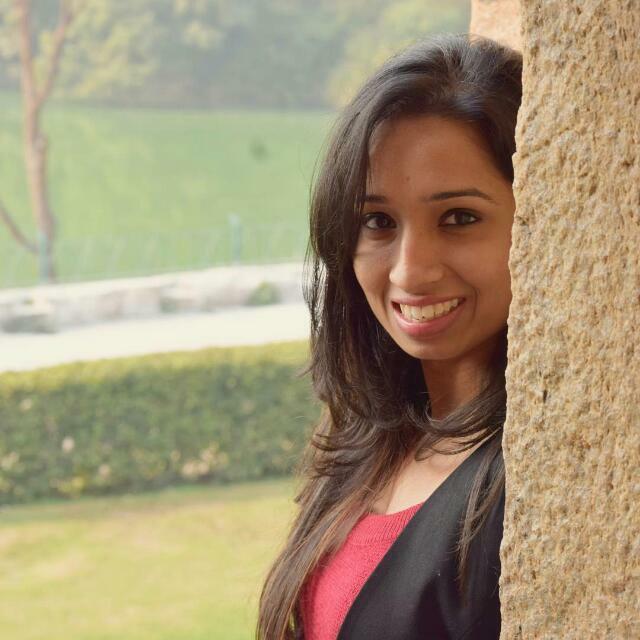 Sonali went on to write, "She dropped everything in a heartbeat to be with me on this journey. She has been my rock...my person... Rupa Tai was involved in my journey from when I was diagnosed to the time I was deciding the course of treatment to packing her bags and coming with me to New York. She was there from get-go. Her transition from one role to another was seamless. A dictator when I needed to eat right or take my meds or an empathetic counselor alternating between giving advice and offering silent support when all I needed was to be alone with my thoughts. She was around. She was with me and by me, at all times." Wait until you read what Sonali had to say next. Spoiler alert: It will make you see your sibling in a whole new light and miss them. "Sisters share a special relationship. We are literally an extension of each other. For bad days, her presence did the trick and the good days...well, it just got better! 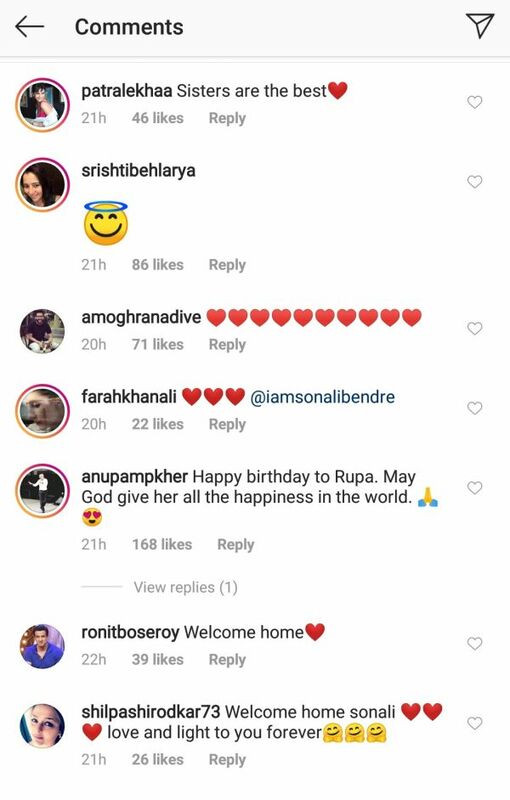 We have now returned home - to our respective families and lives, but us together in New York for those 6 months...I am forever indebted..."
It is Rupa's birthday today and we don't think Sonali could have picked a better occasion to show her some love. Here are all the pictures from Sonali's album. They truly show the deeply caring relationship they have with each other. And just as we suspected, sweet comments from Bollywood started pouring in on the post. 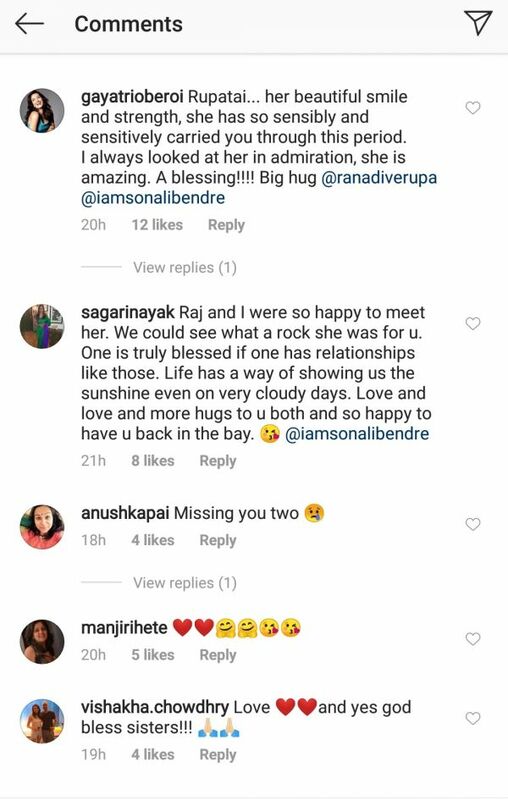 Of all, Patralekha, Ronit Roy, Anupam Kher and Sonali's bestie, Gayatri Oberoi's comments made our day. What a beautiful bond they share!